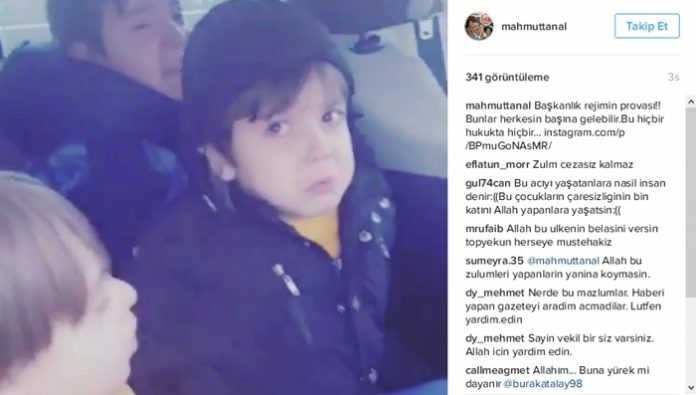 A video shared on Monday on social media shows five children left alone in tears in front of Sincan Prison in Ankara after their mother was detained while they were visiting their father in prison. Reaction mounted after the video was shared on social media by Tanal. People say similar incidents have occurred since a witch-hunt was launched against the Gülen movement by President Recep Tayyip Erdoğan and the ruling Justice and Development Party (AKP) following a failed coup attempt on July 15. Renowned cartoonist Carlos Latuff marked the plight of the children with a striking drawing on the Globe Post news portal, which has later gone viral on social media on Jan. 25. 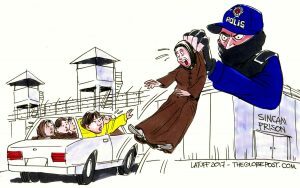 Tanal brought a similar case to Parliament on Jan. 4, when a mother was detained as part of an investigation into the faith-based Gülen movement while her twins were left in an intensive care unit. “There are mothers among us. Can a baby in an intensive care unit be separated from its mother? What kind of mentality does that? Which judicial system accepts that? Which ideology embraces that?” said Tanal in his speech at the Parliament. Meryem, whose given name only was reported in the Turkish media, gave birth to twins by C-section in a hospital in Konya two days earlier and was detained by police despite hospital reports stating that she should not travel and was taken to Aksaray from Konya in a police car. According to reports in the Turkish media, Meryem’s brothers and father and the husbands of her sisters were also jailed over links to the Gülen movement. Other of Meryem’s family members are now collecting breast milk from her in Aksaray and bringing it to the Konya hospital to feed the twins in the intensive care unit. A total of 1,218 people were detained, with 572 of them put under arrest, in operations targeting the Gülen movement over the past week, according to a statement from Turkey’s Interior Ministry on Monday. Strongly denying having any role in the putsch, Fethullah Gülen called for an international investigation into the coup attempt, but President Erdoğan — calling the coup attempt “a gift from God” — and the government initiated a widespread purge aimed at cleansing sympathizers of the movement from within state institutions, dehumanizing its popular figures and putting them in custody. More than 135,000 people have been purged from state bodies, in excess of 90,000 detained and over 43,000 have been arrested since the coup attempt. Arrestees include journalists, judges, prosecutors, police and military officers, academics, governors and even a comedian. Critics argue that lists of Gülen sympathizers were drawn up prior to the coup attempt. A report prepared by the EU Intelligence Analysis Centre (IntCen) has revealed that although Erdoğan and the Turkish government immediately put the blame for the July 15 failed coup attempt on the faith-based Gülen movement, the coup attempt was staged by a range of Erdoğan’s opponents due to fears of an impending purge, according to a report by The Times newspaper last week. The European intelligence contradicts the Turkish government’s claim that Turkish-Islamic scholar Gülen, a cleric living in self-exile whose views inspired the movement, was behind the plot to overthrow the Turkish government. This article originally appeared in Turkish Minute on Jan 23.